Just launched a nonprofit CPAW NJ to raise awareness about outdoor cats and the importance of spay/neuter and to provide surrender prevention help so people can keep their pets. I was born on a farm in southern MI and animals have always been my best friends. Beginning in 2013 I began volunteering at my local shelter because I had heard of the poor conditions there. We worked to help conditions improve, but there was NEVER enough time or resources for TNVR or surrender prevention. So I traveled the country educating myself on what other shelters and groups do, including attending the Austin Pets Alive No Kill conference last September. What an eye opener! That’s how our group was formed….the best way to help animals is to prevent them from ever having to enter the shelter. CPAW NJ is leading an effort to collaborate with all of those helping outdoor cats to provide education, resources and best practices to local TNVR, as well as giving classes on cat behavior and counseling folks experiencing cat behavior problems. We do it through compassion, collaboration, and celebration … four paws at a time! Miss Inez was about 10 years old when I rescued her. She had spent most of her life in a shelter cage, and was living right next to all of the barking dogs at the shelter where I was volunteering. You couldn’t really touch or hold her, but her soulful eyes cried out to me every day and I finally brought her home. (See pictures). I tried for a year and a half to introduce her to my crew to no avail. Then my youngest son agreed to take her with him to MIT graduate school as she was much healthier than his older cat to help out our house and to hopefully give her a wonderful life. As you can see from the pics, the #missinezmitjourney continues very happily today! I wish people knew that a cat’s behavior isn’t about the human but that cats are usually just trying to satisfy their basic needs for safety and security, stimulation thru environmental enrichment, and their natural instincts like hunting and scratching. Provide these things and you will have a happy family member! And, as Cat Daddy says, MOVE. AT. THE. SPEED. OF. THE. CAT! I’m a retired attorney who is dedicated to CPAW NJ and promoting animal welfare full time. I adore my five cats and have just finished both an inside catification as well as this week a custom built catio! I love to sew, read, and visit my two sons and family. I’m so blessed to have the ability to devote myself to this wonderful cause. 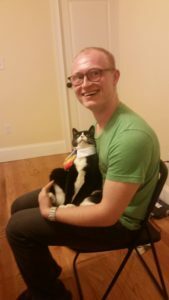 I’m taking lots of classes, including missing animal recovery, and generally help any of my friends with a cat question. And last week I trapped my first cat! …of the impact it will have to raise human awareness about community cats and the people who love them. And it will be so FUN! Go follow Karen on Instagram (@cpaw_nj). And be sure to follow @CatRescuersFilm on Facebook, Twitter and Instagram! 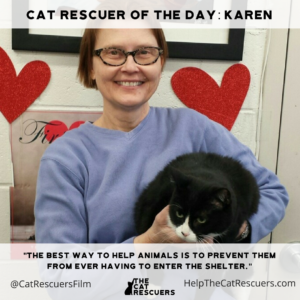 Want to be Cat Rescuer of the Day? Submit Your Answers Now to Be Featured!